So. I know it’s been six months, but I can explain. The Ministry and I got married. Turns out getting married is really, really, really time-consuming and turns you into a crazy banshee unable to form coherent thoughts, let alone write them down. But it also turns out that being married, especially to someone as awesome as the Ministry, is really, really, really great and spending a year becoming a banshee is totally worth it. Anyway, back to the blog! I promise I won’t leave you again. Probably. And to celebrate (plus give my new carefree life meaning) I have decided to embark on an Ambitious Project. Think Julie and Julia, but books instead of cooks, huhuhuhuhuh. Many literary fiction. Much sci-fi novels. Many a year ago I worked at a well-known secondhand bookshop in Perth (more about that never) and there was such a stream of delicious, quirky literature streaming under my nose, and all so stupidly cheap, that I quickly amassed a novels collection of epic proportions. Multiple children’s and young adult classics. Major crime. Oops. How did those get there. 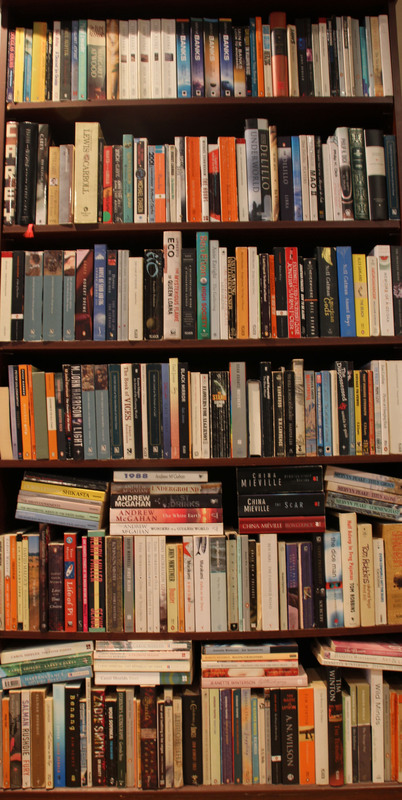 After that, I worked at a specialist non-fiction and technical bookshop, another Perth institution, and despite being someone who only rarely reads non-fiction, I now also have a fabulous collection of non-fiction too. Result: moving house (think I have moved 4 times since then in about 10 years, jeez, talking in decades makes me feel old) became something of a challenge, with me turning into a creature that looks like one big cardboard box with staggering legs for the duration of each move. So when the Ministry and I bought and moved into Shell Cottage, nearly a year ago (we like to pile stressful life events All On Top of Each Other) I was quite ruthless and got rid of a lot of books so as to avoid the staggering, and also Shell Cottage is very small, though lovely, obviously. So now instead of a knee-replacement causing, eye-popping, sky-fallingly excessive book collection, it’s just a bit excessive (pictured). 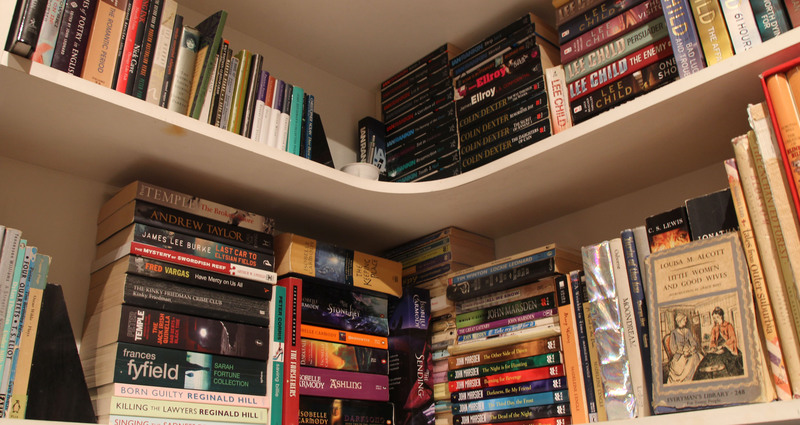 The problem is, I now can’t ever justify buying any more books ever again because there is Simply No Where To Put Them because All the Wheres Are Already Stacked with Books. And that’s no way to live. Plus I have never had time to read all of them, despite what my Best Efforts (stupid Real Job) so despite my careful honing, re-prioritising and general optimization into the coolest collection ever, sadly, I have still only read perhaps two-thirds of my prized babies. I was going to tell you that I was going to read them all in a year, but then worked out that even if I read a book a week, it would still take five years (and that’s just counting the novels). So I’m going for a slightly less insane project – I’m going to read an alphabet’s worth. One year, 26 letters in the alphabet, one book from every author in the alphabet – e.g. one Margaret Atwood, one Clive Barker, one Italo Calvino, etc. And I will try – I swear it – to get rid of the ones that I don’t, er, really need to keep. Not sure what I will do with the slightly less awesome books, perhaps leave them on benches at bus stops to Edify the Masses. Because they will still be GOOD books, as my taste is impeccable, obviously. So please join me as I make a little space, be the best read person in the universe, and Edify the Masses. This entry was posted in Books, Fiction, Non-fiction, The Curing of a Bibliomaniac and tagged The Curing of a Bibliomaniac by Emma Young. Bookmark the permalink. What a brilliant project! My own will be to read every review you write on them. Onward and upward!